All the arrangements are by Gregg Nestor. 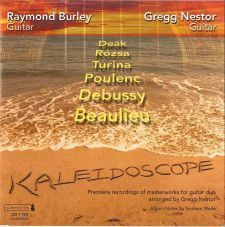 The CD, titled Kaleidoscope is on the Cambria label, downloadable through the eMusic / Classics Online links at the top of this page, the BUY NOW button or Naxos. Kaleidoscope is a major accomplishment by two major players. Gregg and Raymond are like the Hendrix's of classical guitar, only better. Their mastery of dynamics on the delicate Chinese Carillon blew me away. But Debussy's Children's Corner was my absolute favourite. I'm a harpist and I can't even put into words how gorgeous their work is. Their technique is so drop dead perfect I could listen to these pieces forever. They not only inspire my soul, they make me feel so AWAKE, it's like I'd been sleepwalking through life! I can't tell you how wonderful it is to hear real artists play actual instruments instead of having somebody at a keyboard synthesizing them. No machine could ever duplicate Raymond's and Gregg's artistry on their guitars. Gregg Nestor's arrangements are so impeccable, so perfect. The gift is there, man - big time. DON'T MISS THIS ONE. KALEIDOSCOPE is a must have. I kid you not. Burley and Nestor have worked together before – there's an interesting looking BSX Records CD, for example, featuring both of them, and other musicians to boot, playing music by Miklós Rózsa – but this appears to be their first CD 'alone together', as it were. The arrangements are by Nestor, except for the work by Michael Deák, which was composed for two guitars. In the case of the two movements from the Celestial Suite by Toni Beaulieu (née Leone de Paolis), the booklet note doesn't indicate if this is an arrangement or an original work for two guitars. For the record, Rósza's, Debussy's, and Turina's works were composed for the piano – the orchestral version of Danzas Fantásticas came later – and Poulenc's Sonata is the one for horn, trumpet, and trombone. The latter is a work that has completely escaped me until now! There's a tendency to assume that recitals of this type (or oboe discs, or trumpet discs, or what have you) are of interest primarily to listeners who also play those instruments. Balderdash, I say. I don't play the guitar at all, but I enjoy guitar recitals, and I like it even better when more than one guitar is playing. As for arrangements, they don't bother me as long as they are done well. These are. Julian Bream and John Williams recorded an enjoyable version of Debussy's 'Golliwog's Cakewalk' on their Together Again CD, and there are versions of the entire Children's Corner Suite for three guitars played by the Pro Arte Guitar Trio and the Trio de Cologne. This, then, is a CD that is probably best enjoyed late in the day when one is looking more to be relaxed and entertained than to be pointedly critical or analytical. The guitarists play mellifluously and with both taste and style, and there is nothing here that will offend anyone's ears or scruples. In other words, this is a lovely Kaleidoscope, so sit back and enjoy the pretty colors.